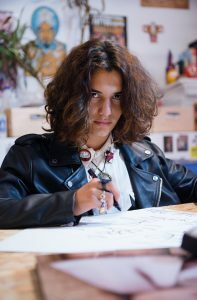 Born in Palma to a French mother, and Spanish father, and now completing his studies at a British school, the trilingual Sobrón appeals to an international audience. His fascination with different cultures began as early as six when his grandmother returned from India with a box full of gods. In his exhibition As Above So Below, in which he blends digital drawing and photography, his self-portrait appears with multiple heads, evoking Hindu deities and other religions. One of his most popular images on Instagram is of a traditional Japanese figure in a kimono covered in familiar bright logos. Rampant consumerism comes to mind. His black-and-white three-piece series showing African ceremonial heads used as plant pots requires more thought, which he finds people less willing to do. He tells me it’s about the commercialisation of cultural icons. On the whole his online presence has led to positive events including collaborations with other creatives in the art and fashion industry. His background is in fine art but it’s fashion design that appeals to him now. Sobrón definitely looks like he’s making a fashion statement. A boiling hot summer’s day hasn’t stopped him wearing a long sleeved shirt he designed himself, black jeans and high-top EZ-LAB boots, the latter with a logo he also designed. Around his neck he’s wearing symbolic beads and necklaces, including a chunky African mask, which he tells me is a passport worn in parts of Africa to distinguish which village you’re from. A passion for fashion runs in the family. His Mallorcan grandfather went to Paris in his twenties to make a name for himself while working there with an important French designer. Later on, together with his wife, they eventually opened a shop on Jaume III selling their designs alongside those by Versace and Cavalli. His brand “Solivellas” has gained international prestige and his collections were sold at some of the most emblematic and luxurious shops world wide. Sobrón’s mother creates Trend Books and is the person he trusts when he needs advice about the industry. Thanks to his perseverance he received plenty of invites from up-and-coming designers at this year’s Paris Fashion Show. His long term ambition is to succeed with his own label. He shows me his capsule collection and a funky trainer he’s designing for Portuguese fashion brand Last Sole. Also he has another collaboration with the french fashion label EZ-LAB. After all I’ve heard, his dream doesn’t sound far-fetched at all.